Designed with innovative features and luxurious finishings, the vessel was the first member of Celebrity Cruises’ exciting Edge Class of ships, to be joined by three more ships by 2022. It has been more than six years since Celebrity Cruises added a new ship to their fleet, and their team have spent this time designing and crafting a ship which looks set to appeal to a wide and discerning audience. Introduced during a massive industry event, Celebrity Edge is more than just another cruise ship, it is truly revolutionary. Guests 1&2 will enjoy Free Classic Drinks Packages Plus the Second Guest on the booking will receive a saving of 50% from the Cruise Only fare. For all other eligible destinations Guests 1&2 will enjoy Savings of upto £700 on Selected Rest of World sailings Plus Free Classic Drinks Packages. Celebrity Edge sailings in the Caribbean & Europe additionally receive Free Pre Paid Gratuities. All Additional Guests receive a 50% Saving Plus a Classic Non Alcoholic Drinks Package. Includes 3nt Miami Stay! , FREE Drinks, Gratuities & upto $300 OBC on Oceanview and above! Brand New Luxury - Celebrity Edge , FREE Drinks, Gratuities & upto $300 OBC on Oceanview and above! WHY CRUISE ON CELEBRITY EDGE? Perhaps the most talked about feature of Celebrity Edge is the Magic Carpet, an amazing feat of engineering which will serve as gangway, public space and restaurant. As mentioned above, the Magic Carpet, will be home to multiple dining areas through the week and will undoubtedly become one of the main focal points of the ship. Designed by leading architect, Tom Wright (designer of the Burj Al Arab in Dubai), the Magic Carpet is perched at the side of the ship and can move up and down the decks, between Deck 2 and Deck 16. As well as transporting guests from port to ship without the need for a gangway, the Magic Carpet is an attractive and welcoming venue. The ship boasts another evolving dining and entertainment venue – Eden. At 12,000 square feet in size, with three-storey, panoramic windows and al fresco dining, Eden provides a spectacular setting for breakfasts, lunches, dinners and celebrations. Or for something a little more playful, head to the Rooftop Garden, a living urban playscape, reminiscent of childhood playgrounds. Then delve into the Retreat Sun Deck, a chic open-air paradise complete with large swimming pool, two-storey hot tubs and even pool butlers. Celebrity Edge’s 2019 sailing season will see her explore the delights of Europe – navigating the waters around the Mediterranean. Rome, Naples, Barcelona, Monte Carlo and more are yours to experience from the deck of Celebrity Edge. Arrive in ancient cities and delightful regions in the ultra-luxury surroundings of this next generation ship. 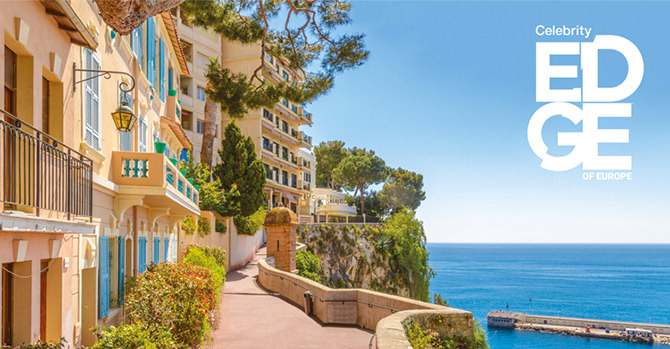 Whether you’re savouring the tapas culture in Catalonia, picking out your dream yacht in Monaco or stretching out on the beaches of Mallorca – there’s something for everyone during your European adventure on board Celebrity Edge. Promising incredible levels of luxury and decadence on the seas, Celebrity Edge has a high percentage of large suites and villas for guests to relax in after another exciting day exploring the world. One of the most exciting features of t Celebrity Edge’s accommodation offerings is the ‘infinite verandah’, allowing the beautiful vistas surrounding the ship spill into the delightfully-appointed suites. Guests can now get right to the edge of the ship, almost touching the Caribbean waters they are passing through, offering the most immersive experience for first-time cruisers and experienced sea dogs alike. With Bvlgari bath products and sophisticated flourishes throughout, Celebrity Edge suites promise to offer accommodation to rival even the most luxurious on-land hotels. With a series of relaxing itineraries planned for the ship, the Celebrity Edge will provide the perfect platform to truly recharge and refresh while at sea. Celebrity Cruises have a fierce reputation for providing exquisite and varied dining options aboard every single one of their vessels. From traditional classic menus to modern haute cuisine, all using the freshest ingredients sourced from around the world, the on-board fare has been designed to stimulate every taste bud and every palate. This trend will undoubtedly continue aboard Celebrity Edge, with the cruise line eager to treat guests to the finest food and drink on the open seas. However, one of the ship’s most exciting features, the Magic Carpet, will play host to an outdoor restaurant with panoramic views at lunchtime and a romantic dining venue under the stars when the sun sets. Watch our video and see what Celebrity Edge has to offer!